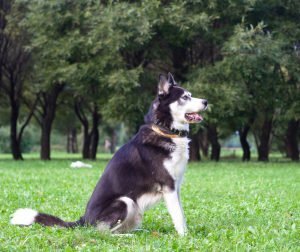 Latency In Dog Training – What is it and why is it important? This article is part of our ‘language of behavior’ series. You’ll most likely hear dog trainers talk about latency as something to get rid of or decrease. That’s because latency is the gap between you delivering a ‘cue’ and your dog’s response. If you say ‘sit’ to your dog, and he always sits immediately, you don’t have a problem with latency. At least, not with your sit. If you say ‘come’ to your dog and he bounds towards you without hesitation, you don’t have a problem with latency in your recall either. Removing latency is all about removing that gap. Getting rid of delays, reducing the space between cue and response to the absolute minimum so that we have a nice ‘sharp’ reaction to our cues. Latency is not the same as speed. That’s because latency is about the gap between a cue and the moment that the dog begins to respond. Not about the time he takes to carry out that response and complete it. In this case, you have a problem with speed. But we’ll look at that in a different article. To reduce latency, we need to reinforce responses with less latency and omit reinforcements for responses with greater latency. But this can be difficult to judge. So it’s a good idea to look at ways of measuring latency. A simple way to do this is to count in your head whilst awaiting a response from the dog. You can count the seconds (one thousand, two thousand, etc) between giving a cue and pressing your clicker to mark the start of the response. Once you have figured out the range of latency durations that the dog is currently offering, you can begin to address the problem by refusing to mark and reward the longest gaps. And by only reinforcing responses with shorter latency. Like any other aspect of training, it’s important not to demand too much, too soon. Reduce the gaps gradually. Our aim in dog training is to have a dog perform a behavior fluently. Latency is just one of the three components of ‘fluency’ in trained behaviors. Don’t forget to join our email list in order to have our latest articles delivered free to your inbox!